Looking down at a man sitting on the ground digging with a stick in a garden. 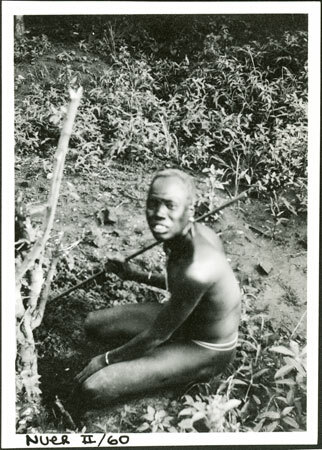 Cultivation, along with fishing, was considered a subsidiary but necessary activity by the cattle keeping Nuer. Based on film numbers this image is likely to have been taken at Nasir post during Evans-Pritchard's second visit there in 1935. Note on print reverse ms pencil - "28 1 4 A236" & print front border ms ink - "NUER II/60"
Morton, Chris. "Nuer man cultivating" Southern Sudan Project (in development). 03 Jan. 2006. Pitt Rivers Museum. <http://southernsudan.prm.ox.ac.uk/details/1998.355.79.2/>.